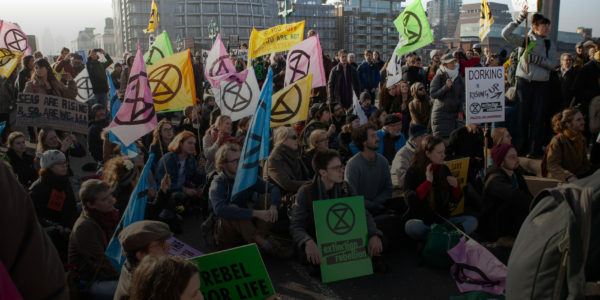 You might hear two types of assemblies mentioned when learning about Extinction Rebellion – Citizens’ Assemblies and People’s Assemblies. You can find out more about how they work and the differences between them below. Assemblies are formed as a way for large groups of people to make decisions. A Citizens' Assembly is formed of randomly selected groups of citizens to make political decisions on controversial issues, while People's Assemblies usually involve self-selected groups that get together to make decisions, discuss issues or organise. Citizens’ Assemblies (CAs) are a group of randomly selected citizens, from 100 to 1,000 in size, that represent a microcosm of society. The formation of a Citizens’ Assembly is XR’s third demand. They are brought together to make political decisions, particularly on issues that are too controversial for politicians to risk their careers. This process can take from months to years. CA members go through a deliberative democracy learning process where they have access to experts and listen to many points of view and differing interest groups, before they come to a decision. Members often find that even though they came to the issue with their own strongly held ideas and thinking, they will have their mind completely changed through the deeper knowledge and wider perspective gained through the process. Academic research shows that people trust citizens’ assemblies. Whereas no-one trusts politicians. Read more about Citizens' Assemblies. People’s Assemblies (PAs) are a group of self selecting people who come together in an assembly, often in occupied spaces as part of a movement towards revolutionary change (Tahir Square, Occupy, Gilets Jaunes, etc.). The people’s assembly will use participatory democracy, that is, everyone’s voice is heard equally and no voices lead. The aim is for the collective voice of the entire assembly to become involved in arriving at a decision. Trained facilitators are used to support the process. People will find that even though they have come to the issue with their own strongly held ideas and thinking, they will have their mind completely changed through the deeper knowledge and wider perspective gained through the process. Human experience shows that people trust people’s assemblies. Whereas no one trusts politicians. Read more about People's Assemblies. There is more info about Citizens' Assemblies on our 3rd demand. You can find further details and resources on our People's Assembly page or participate online at the link below.